Well, figuratively speaking I am. 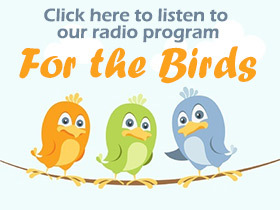 I have always loved birds and find their chirping and tweeting always picks up my spirits. I love waking up to their sounds in the morning and will leave off the air conditioning in exchange for hearing their happy sounds. I am on the Board of Directors of the Northeast Pennsylvania Audubon Society and was honored when asked if I would like to participate in a study being done on Ospreys, Puffins and Terns. These birds all fall into the seabird species, a third of which are threatened with extinction. The National Audubon Society and explore.org teamed up to stream video from Seal Island National Wildlife Refuge to anyone with an Internet connection. Located about 20 miles offshore, the island has the largest puffin colony in the U.S. Common Terns also breed on this island. So what’s my involvement with this project? I am one of the cam operators. There is a team of us and we all take two or three hour shifts each day remotely operating the cams that are streaming the live video. While we observe we take notes on what is going on during our shifts and submit our reports to the project leaders. Puffins are a bit comical looking. They are short and stocky with a large striped bill that is colored red, blue, and yellow in the summer. They have a white belly, black top, and white cheeks, with orange legs. They are about 11 to 13 inches tall and 21-24 inches long and they waddle when they walk. They can dive down to 200 feet underwater using their wings as a source of power to swim and their feet for direction. They can hold up to 30 fish in their beak during mating season (the record is 62.) When not in mating season the Puffin will catch its prey and eat it on the spot. 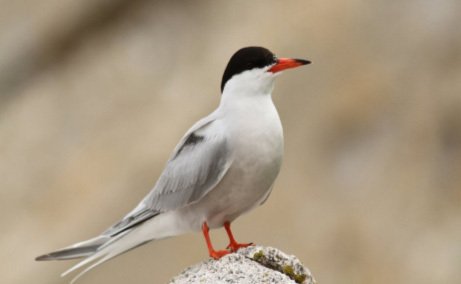 Terns are graceful, black-and-white water birds. They can be seen plunging from the air into water to catch small fish along rivers, lakes and oceans in North America. I would now like to share with you my favorite experience on this project … our Osprey family. I have been watching these birds the longest. The parents are Steve and Rachel. The offspring is Sky (first to hatch,) Ollie (second to hatch) and Sibley, the youngest of the chicks. I have been observing them since they were three eggs that Rachel and Steve brooded. I saw each one enter the world through a cracked shell. I saw them naked and without feathers and observed Steve providing fish for Rachel to feed each one. I was amazed to see how Rachel knew who needed food and who had their share and she would concentrate on the most in need. I saw Rachel on the hottest of days spread her wings to provide shade for her young. I saw her demonstrate skills the chicks would need to know to survive and the chicks mimicking her actions. I have seen them grow each day and evolve into fledglings. Just recently I saw the first and second oldest feed themselves for the first time. I saw them practicing flapping their wings and getting ready for their first flight. Four days ago I was blessed to see Sky fly for the first time and as he took off I found myself screaming for joy and believe it or not I cried. I was so excited to have witnessed this event. I have bonded with this family and I will really miss them when they migrate back to South America. 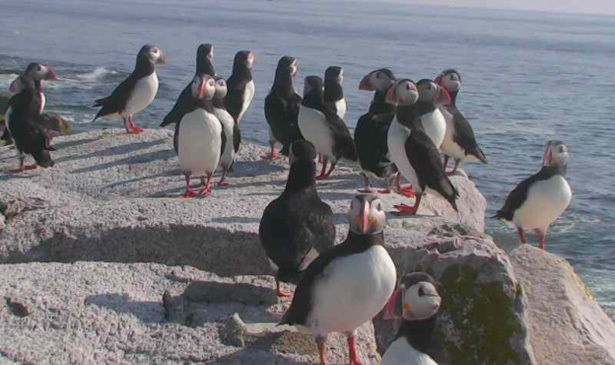 Visit the Project Puffin Live Bird Cams. This year we had the pleasure of awarding two summer camp scholarships to attend the “Coastal Maine Bird Studies for Teens” program held the week of June 17 to June 22nd on Maine’s scenic Hog Island. This year’s recipients were Reed A. Evans, 15, of Milford, Pennsylvania, and Danielle J. Spewak, 16, of Newfoundland, Pennsylvania. Both students attend Wallenpaupack Area High School. These students had the privilege of being tutored by some of the country’s best known birders and ornithologists and had an opportunity to visit Eastern Egg Rock during the puffin breeding season. Northeast Pennsylvania Audubon Society awards the camp scholarships based on scholastic accomplishments and a demonstrated interest in the environment. The Paul F-Brandwein Institute invites you to attend the Dedication of The Brandwein Nature Learning Preserve on Monday, October 8, 2012 at 10am. Light refreshments will be served followed by a brief walk along the trails.